Scaffolding, also called scaffold or staging, is a temporary structure used to support a work crew and materials to aid in the construction, maintenance and repair of buildings, bridges and all other man made structures. 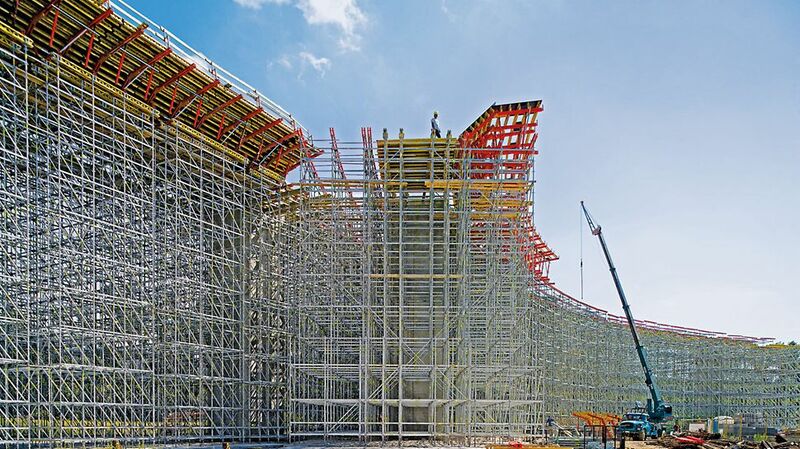 Scaffolding is also used in adapted forms for formwork and shoring, grandstand seating, concert stages, access/viewing towers, exhibition stands, ski ramps, half pipes and art projects. The type-tested PERI UP modular scaffolding systemwith integrated safety features allows the same components to be used as shoring, stair towers, reinforcement scaffold or working platforms. In addition, numerous other applications are possible, e.g. as suspended scaffold. This means that on-site material requirements are automatically reduced and utilisation rates increase. With PERI UP, construction progress can be carried out extremely efficiently and safety levels for site personnel rise considerably. 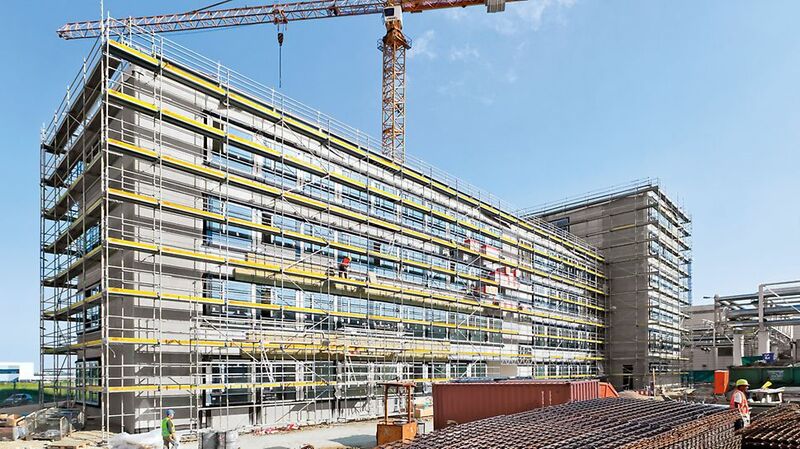 The number of parts which are to be stored, moved on site and transported is decisive for ensuring efficient completion of scaffolding tasks as well as operational cost-effectiveness. In addition, a small range of components results in a lowering of the investment costs and utilization rates are increased. With the PERI UP modular scaffold system, only a few components are required in order to economically realize an extremely diverse range of on-site scaffold operations. 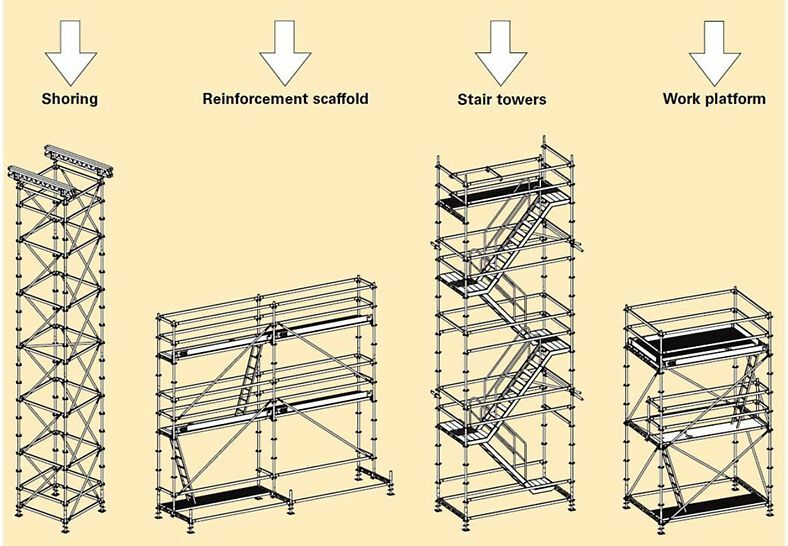 there are basic 9 type of components of PERI UP scaffolding. Shoring is the process of supporting a building, vessel, structure, or trench with shores (props) when in danger of collapse or during repairs or alterations. Shoring comes from shore a timber or metal prop. Shoring may be vertical, angled, or horizontal. PERI UP Rosett shoring towers have been type-tested for heights of up 21.89 metres. Use on the construction site is therefore very easy: project-specific static verification for the towers are no longer required and prepared parts lists are available for all heights. Through base widths of 1.50 m to 3.00 m, square or rectangular tower ground plans are possible in 50 cm increments. This means cost-effective bearing capacity and geometrical adjustments can be achieved. Thus, up to 10 different towers can be realized for a broad range of applications in the form of shoring, slab tables or material platforms. it can carry load up to 40 KN per leg for very large heights also. 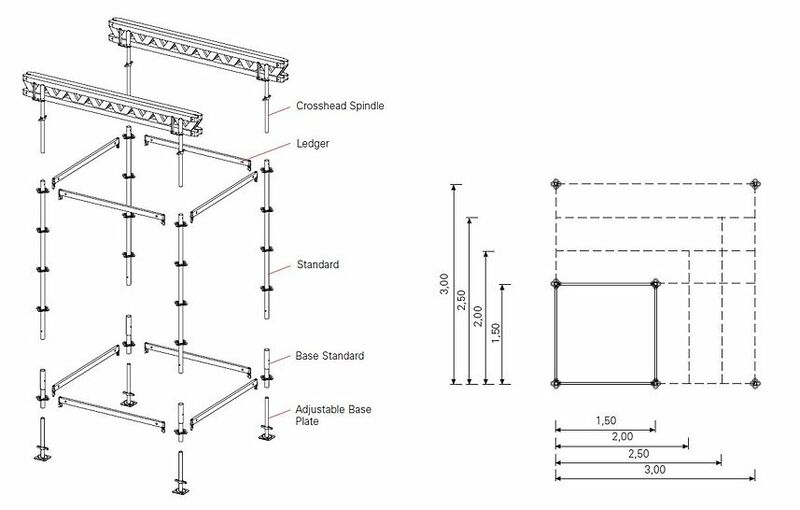 the assembling of basic shoring tower can be done as below for different crosssections. Working Scaffold is a temporary structure used to support a work crew and materials to aid in the construction, maintenance and repair of buildings. The PERI UP work platforms provide secures and productive working conditions on walls and slabs – at all heights. Longitudinal and width adjustments are possible in 50 cm increments. Erection instructions, included with each tower, provide all the necessary information for safe assembly and use. The standards are joined to each other by means of tension-proof connections connections which means complete platform units can be moved by crane. The kit principle allows easy and simple extensions to be made to the required levels. In addition, quantities of materials can quickly be determined and ordered. Extremely stable units are delivered to the construction site which do not need anchors or ballast and can be moved and repositioned without any modifications. Erection instructions are provided for the reinforcement scaffolding and contains all safety-relevant guidelines including the crane attachment points. The heights required have already been taken into consideration with the configuration of the scaffolding units during formwork planning. 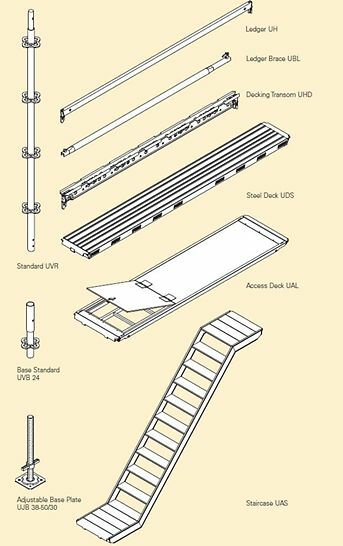 Even after only a few uses, more than just the costs of approved scaffolding equipment can be generated.